What we know for sure is that fermenting was practiced in Mexico dating to several thousand years ago with the extraction of aguamiel (honey water) from certain species of the majestic agave succulent, which when left to ferment becomes pulque. And that agave itself has a history of being used as a source of nutrition going back roughly 10,000 years. But there’s a big difference between (1) allowing fruit, agave nectar or anything else to ferment, inhibiting its decomposition and enabling its imbibers to become inebriated, and (2) deliberate advance planning and the use certain tools, resulting in distillation. During or about the 9th century, the modern alembic, or still, made with a serpentine condenser alongside, arrived in what is now Spain as a consequence of the invention by Arab alchemist Jabir ibn Hayyan. Non-Muslims who were already fermenting grapes quickly realized that distillation, for whatever purpose initially intended, could result in production of a high alcohol content spirit extremely agreeable to the palate. And so when The Conquest began, the Spanish armed with this knowledge came across indigenous populations which were already drinking pulque, and likely baked sweet agave piñas (pineapples, or rather the hearts of the carbohydrate-rich agaves) which had been fermented. The gap had been bridged. 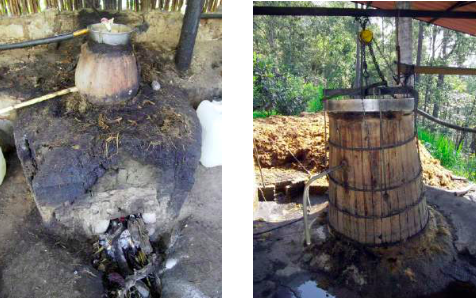 It is this style of still, the two sided alembic, which is frequently used in mezcal production today. It has been suggested however, that the technology had its first application in the distillation of sugar cane which the Spanish imported for rum production. It has been suggested that this type of still was introduced to what are now Colima, Guerrero and/or Jalisco during the 16th century by immigrants from the Philippines and the Solomon Islands who established a community for the purpose of developing coconut plantations. Local materials used in their homelands for fashioning small yet effective equipment for making their coconut distillate, principally clay (and likely reed), were available in this new North American environment. In fact, to this day the term “tuba”, the fermented coconut liquid which was thereafter distilled, is used in some parts of Mexico to describe fermented agave, despite its Filipino origin. Last year’s publication of El Mezcal, Una Bebida Prehispánica at minimum makes us rethink our understanding of the origins of agave distillation in Mexico. Authors Mari Carmen Serra Puche and Jesús Carlos Lazcano Arce, together with their associates from various disciplines, spent in excess of a decade researching in Oaxaca and Tlaxcala. They have purportedly debunked all previous theories, having uncovered ovens containing burned stones with runoff stains they concluded after analysis had been created by baked agave piñas. But has literally hundreds of years of research and umpteen publications been thrown to the wind? Certainly not. The foregoing finding in and of itself is not determinative, since it suggests nothing more than converting carbohydrates to sugars, and a reasonable likelihood of fermentation thereafter. It’s the unearthing of pre-Hispanic pottery fragments they identified as parts of stills that is most significant, suggesting pre-Hispanic distillation dating to perhaps 2,500 years ago. Others have previously proposed similar theories, but that of Serra Puche and Lazcano Arce is the most comprehensive and convincing to date.